Skyline the over-hyped science fiction Alien invasion picture opened this weekend and was expected with all its big-buck advertising campaigns to do quite well. Rather it seems that Megamind, the animated tale of a big-brained baddie with a secretly soft heart, is going to reign supreme for the second week in a row. Skyline, meanwhile, will compete for ticket buyers with Denzel Washington's runaway-train action movie, Unstoppable, which also opens this weekend. 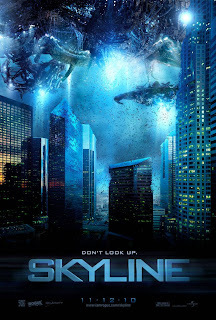 Skyline leapt out of Comic-Con with a surprising buzz, a film no one had really heard about that, after the convention, was firmly on the fanboy radar. Universal has since taken a gamble and declined to screen the movie for the media, choosing to let the fans themselves decide if the flick is a worthy addition to the alien-invasion genre. A few critics, though, managed to sneak into advance screenings. The reviews, thus far, are pretty bad. "Jarrod (Eric Balfour) and his girlfriend Elaine (Scotty Thompson) visit Los Angeles to stay with his successful best friend Terry (Donald Faison) in a luxurious high-rise apartment. Beams of light strike down on the city, vast alien machines and creatures appear, and Jarrod — who has just learned that Elaine is pregnant — decides that his family will survive." — Kim Newman, Empire Online. I'm reading: [SKYLINE] GETS BUTCHERED IN ITS FIRST REVIEWSTweet this!